Have you ever authenticated your designer handbag? Is it real? Is it a fake? If you didn’t buy it new directly from the brand’s retail store or official web site, you may be one of the many millions of people who get duped by the alarmingly good knock-offs that exist. Thanks to the combined knowledge of handbag addicts, experts and bloggers, we pieced together a list of 12 ways that can help you determine the authenticity of your favorite designer handbag. 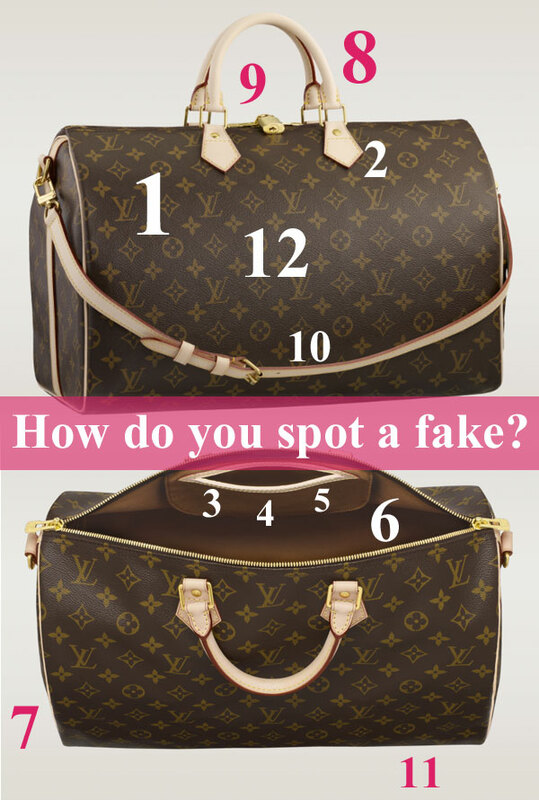 So check out our 12 ways to spot a fake Louis Vuitton. Once you do, we’re convinced you’ll take a break from the fake. Happy shopping. 1. Patterns: The LV monograms on a real bag will always line up horizontally and vertically, and they will never overlap with the zipper. The pattern will never repeat at an angle. 2. Stitching: Real Louis Vuitton bags have intricate, careful stitching. The stitching will be the same on similar places on the bag. For example, at all four spots where the handles connect to a Speedy bag, there will be 5 even stitches at the top of the connecting piece. 3. Fonts: Check the imprint on the inside of the bag. The “O” in a real Louis Vuitton will be an exact circle. The O on a fake Louis Vuitton may be closer to an oval. 4. Date codes: Starting in the early 1980s, Louis Vuitton imprinted the interior of all their bags with date codes. These are in the form of two letters and then 3 or 4 numbers. Real Louis Vuitton bags do not have “serial numbers” or any other markings that would be specific to a single bag. 5. Made in…: Louis Vuitton manufactures bags in France, the US, Spain, Germany and Italy. If a counterfeiter is careless enough to state where their fake was actually produced (in China for example) it is clearly a fake. 6. Interiors: The inside of a real Louis Vuitton is very simple, and rarely contains inner pockets with LV monogram patterns. 7. Dust bags: A real Louis Vuitton dust bag is simple, with either the LV monogram or the words “Louis Vuitton.” It does not contain any more information than that. A real dust bag will also be made of quality material (not cheap plastic) and will have square corners, not rounded edges. 8. Handles: Real Louis Vuitton handles are thin, spaced close together, and rarely wrapped in plastic. 9. Hardware: Real Louis Vuitton bags have brass and gold metal hardware, not plastic. Zippers will have LV printed on them. 10. Tags: Real Louis Vuitton bags do not have “Authenticity Cards.” They also never have tags attached to the bag. Tags will usually come with the receipt, or tucked into the inside. 11. Colors: Real Louis Vuitton multicolore bags contain at least 33 distinct colors. Fake multicolore bags have at most 20 colors. 12. The Golden Rule: If it looks too good to be true, it probably is. Real Louis Vuitton bags retain their value and often go up in value as they get older. Louis Vuitton does not wholesale their bags, nor do they have outlet stores. If you see a Louis Vuitton bag for substantially less than it cost new, it is most likely fake. Maybe a good knock-off doesn’t matter to you. But we think designer handbags should be the real deal. Like an authentic work of art. HipSwap vintage and barely worn handbags are fabulous indeed. But they’re even more fabulous because we do our best to weed out the fakes, and showcase the gorgeous authentic beauties.